Are Eggs a Good Food for High Blood Pressure? Eggs provide a number of essential nutrients, including protein, riboflavin, phosphorus and selenium. There are also some nutritional drawbacks to eating eggs, however, including the amount of saturated fat and cholesterol they contain. Even so, eggs may have a beneficial effect on your blood pressure levels when consumed in moderation. While you shouldn't go crazy and eat multiple eggs per day, eating them a few times a week may have some blood pressure benefits. A study published in "The American Journal of Clinical Nutrition" in December 2005 found that people who ate one to three eggs per week had an 11 to 21 percent lower risk for developing high blood pressure than those who ate eggs less often. The protein content in eggs, which have 6.3 grams per large egg, may be partly responsible for their potential beneficial effects on blood pressure levels. Higher levels of dietary protein were associated with small decreases in blood pressure in a meta-analysis published in "PLOS ONE" in August 2010. Not all of the studies included in the analysis showed a benefit from protein consumption, however, and it appears the benefit is strongest from consuming plant protein. Research at Jilin University in China has found that a particular peptide, a component of proteins, in egg whites may have a similar effect on blood pressure as the commonly prescribed medications called ACE inhibitors, according to an April 2013 article published in the "Daily Mail." People who have high blood pressure are typically advised to lower their saturated fat consumption to help lower overall heart disease risk. Saturated fat itself doesn't appear to either increase or decrease blood pressure levels, according to a study published in "The American Journal of Clinical Nutrition" in February 2006. You should still limit your saturated fat consumption, which can be hard to do if you eat more than one egg per day. Each egg has about 8 percent of the daily value for saturated fat for a person following a 2,000-calorie-per-day diet. Eggs are high in cholesterol, with about 186 milligrams per large egg -- 62 percent of the DV for cholesterol. This has led some people to avoid eating eggs due to concerns about increasing their risk for high cholesterol and heart disease. Research is conflicting in this area, but some studies show no increased risk from moderate egg consumption. For example, a 2013 meta-analysis published in the "British Medical Journal" found that eating up to one egg per day didn't increase the risk of heart disease or stroke in healthy people, although there was a potential increased risk in people with diabetes. How Can a Vegetarian Get 200 Grams of Protein? 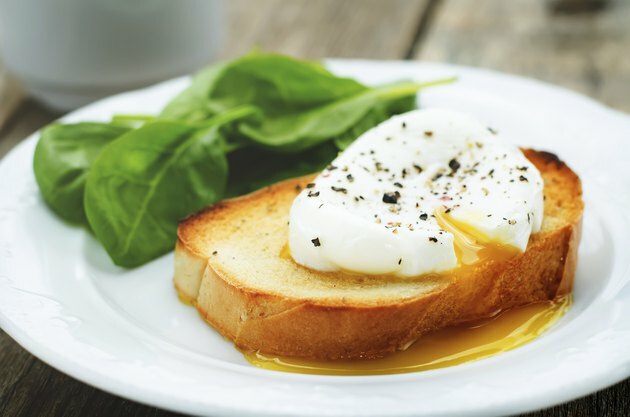 Are Eggs Bad to Eat When Losing Weight? Can You Eat Eggs If You're a Vegetarian?